« Lose The Blues With A Gratitude List! Long after the dust has settled, though, some people are inclined to continue to ruminate and replay negative scenarios over and over again. This only serves to feed the flames of injustice and keeps the anger front of mind, long after the offending party has moved on physically and/or emotionally. As a result, rehashing the past can seem to perpetuate an aura of general negativity in your life. This is when a generally pleasant temperament can swoop in to save the day. If it has been determined that nothing more can or should be done regarding a specific issue, then a positive state of mind can help create a different perspective and lighten the load. For some, this turnaround does not seem natural. They would argue that their disposition has always remained the same and that ‘pretending to be happy’ is artificial and does not solve anything. This may well seem so, however, it is good to know that it is possible to cultivate a more gracious state of mind if that is the desired outcome. Being good-natured or charming is usually effortless when things are going smoothly. The challenge comes when rough waters are encountered. This is when it is important to work on maintaining that generally positive bearing. Approaching life with an outward appearance of calm thoughtfulness can help you reduce stress internally and encourage clear thinking. Whether it takes a minute of deep breathing, a scheduled meditation, going for a walk, working out in a gym and/or enjoying family and friends, it is important to feed your soul with positive influences. In time, as you continue to keep the goal of a peaceful countenance with thoughtful discussion at the forefront in challenging situations, you will gradually feel differently and you will notice the affect this has on others. 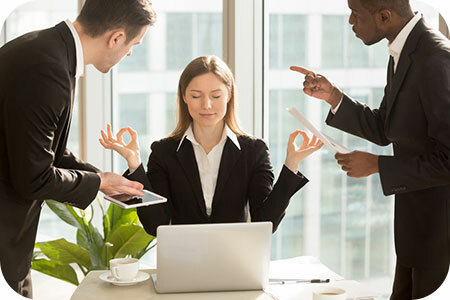 Regardless of the seeming impossibility of remaining calm when faced with a confrontation, your ability to diffuse a situation before it escalates will keep your own stress level in check and allow you to think rationally. Ask questions to attain more information and clarity before making a regrettable statement. Above all, do not allow someone else to determine your state of mind or dictate your actions.